Are we on the brink for the next recession? Business leaders and pundits are busily putting forth their predictions for the next economic downturn, with much of the chatter focused on whether a recession is due to hit in 2020. For the senior housing industry, it could be argued that it has been teetering on the brink for some time, with lofty real estate valuations, poor occupancy numbers, staffing shortages, wage pressures and the slow rise of interest rates. With an overheating job market and real estate bubbles among classic signs of coming recessions, the industry could be seen in some respects as a bellwether. These three stories highlight the biggest challenges facing owners, operators, developers and industry professionals. And these challenges cannot be solved next week, next month, or next year; they will likely still be facing the industry to some extent come 2020, when a recession may beset the overall economy. While senior housing is a needs-based product that, to some extent, is resilient in economic downturns, the industry could be in a real danger zone if it remains fragile in key areas when a broader economic dislocation takes place. The occupancy rate for assisted living communities averaged 85.2% nationwide in the second quarter of 2018 according to the latest figures from the National Investment Center for Seniors Housing & Care (NIC). This represents a drop of 0.6 percentage points from the first quarter of this year—as well as the lowest level for assisted living occupancy since NIC began analyzing the data in late 2005. Good but not great absorption paired with sustained inventory growth does not bode well for an occupancy turn-around anytime soon. There is no shortage of new development press releases streaming in daily, making a short-term slow down in new construction dubious at best. The other two headlines, about skilled nursing staffing shortages and a mother allegedly killing her son rather than go to assisted living, highlight the extent of the labor crisis facing the industry and the ongoing image problem that senior living has. Nobody wants to admit they have a problem and all of those statements should be taken with a grain of salt. It will be a long, tough slog for the next four to five years to get to the point where demand will surge and even when the surge occurs, there won’t be lines at the doors to the nearest senior housing community. Even then, there is an argument that the large surge won’t be until 2030 as the average age for assisted living continues to rise. The carrying and liquidation costs of excessive inventory are debilitating for most businesses and the senior housing industry will feel a similar pinch as more distressed or “value-add” opportunities arise with sub-performing communities. With companies like LCS raising $300 million in a fund for value-add opportunities, there are clearly teams of professionals ready to pounce on opportunities when they come clear. Those with immediate access to capital and liquidity stand to be the winners until inventory growth slows. However, raising capital to acquire assets will only get the industry so far. Further investments in technology through entities like the Ziegler-LinkAge Fund or initiatives to improve the industry’s image or help with staffing initiatives from advocacy and trade organizations like LeadingAge, Argentum and the American Seniors Housing Association (ASHA) are becoming urgent. 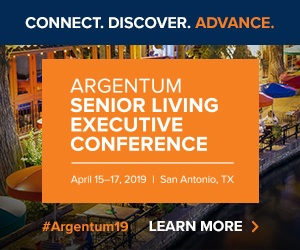 As more portions of health care are delivered to where individuals live, the next few years will be critical for the senior housing industry to elevate not only its image but the value-add proposition for lower acuity residents and addressing the problem of affordability. The need for innovation and disruption is immediate and will need to endure to meet the demands of the Baby Boomer generation. The pressures to weather an economic downturn ahead may finally bring the innovation that so many have been championing for many years. A looming recession and the time gap between today and 2025 in the demographic surge presents the industry an opportunity to find creative operating models. The new business opportunities will not be driven solely on the statistical reality that the demand will be there in 2025 but the reality that in order to get there, providers will need to survive and stay in business during the next recession and for the next few years.